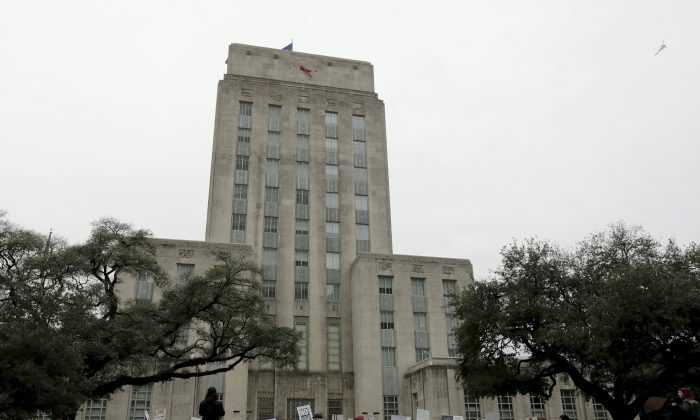 The Houston Communist Party is knowingly breaking the law in Texas, where it is illegal for a communist to hold public office or even a state government job. The Texas law was originally designed to keep violent revolutionaries out of public office. The Communist Party USA (CPUSA) does not openly advocate violence these days, because its primary means of “struggle” is through the Democratic Party. Make no mistake, CPUSA is a Leninist party. Vladimir Lenin’s method of achieving revolution was through strategic deception. A good Leninist will feign peaceful intent when out-numbered but will unhesitatingly use force when the balance of power shifts in his favor. To subvert Texas law, the Houston communists ran candidates for office in this election cycle who all posed as Democrats. The communist plan to break state law was revealed in a July interview, “The art and science of building the Communist Party,” conducted by Communist Party USA organizational secretary Joe Sims with Houston Party chair Bernard Sampson. In the 73-minute interview, Sampson openly acknowledges that it is illegal to run as a communist in Texas, while boasting that his Houston Communist Party Club is running four candidates for public office this cycle—two of whom he identified. The first is a young mother, Sema Hernandez, who ran for the U.S. Senate as a “Democrat Socialist and a Berniecrat” in the Democratic primary against Beto O’Rourke. Sampson named Hernandez as a Houston Communist Club member and, though she lost to O’Rourke, boasted that her impressive 250,000 vote tally was the highest ever achieved by a Texan communist. Hernandez is now a Texas leader of Rev. William Barber’s communist-dominated Poor People’s Campaign, which is currently organizing anti-Trump protests and marches across the country. Comrade Sampson also named Penny Shaw, the Democratic candidate for Harris County Commissioner Precinct 4, as a Houston Communist Party member. Shaw won her primary with an impressive 22,860 votes, or 75.11 percent of the vote. She will now face incumbent Jack Cagle in the November general election. Cagle had better be prepared for a mammoth fight, because Shaw will have the Houston Communist Club’s 200-plus members working diligently door-knocking and phone-banking on her behalf. Shaw will also be supported by overlapping organizations such as Our Revolution and the Texas Organizing Project. Shaw will also likely have the backing of the Coalition of Community Organizations, which is run by Sampson and the Rev. James Caldwell, a pastor who joined the Houston Communist Party. Shaw addressed the July meeting of the Houston Communist Party Club. The comrades seem to have liked what they heard. While not named by Sampson, the third candidate was likely Houston bio-chemist Ali Abbas Khorasani. An open member of both the Houston Communist Party and Houston Democratic Socialists of America, Khorasani ran in the Democratic primary for Texas’s 2nd Congressional District. Khorasani lost the primary but still ran a respectable second place with backing from both DSA and the Communist Party. The fourth candidate is yet to be unidentified. There is, however, one local far-left Congressional candidate who bears watching. “Comrades, I’d like to talk about the growth of the Houston club in the last year and a half, and the reason for that growth. Garcia is also heavily backed by the Communist Party-intermingled Texas Organizing Project and supported by Houston Rising, an alliance of the Texas Organizing Project, the communist-led Coalition of Community Organizations, the far-left Workers Defense Project, and other radical organizations. The CPUSA runs communists on the Democratic ticket all over the country. Ohio Communist Party Chairman Rick Nagin has run several times as a Democrat, often coming close to victory. The Party has boasted that several of its members are elected officials but won’t usually reveal who they are. It is unethical for a communist to run as a Democrat, but in Texas, it’s illegal. Will Texan authorities apply the law? Will they force known communists off the ballot? Will they punish the Houston Communist Party for its deliberate law-breaking? Will the Texas Democratic Party protect its integrity by expelling those who seek to exploit its good name for revolutionary purposes?